Thank you! I am glad that it was of value to you. Azure is spelled wrong. What about SQL? Thank you for letting me know. I’ll correct it. Any info on Informatica or ETL tool? Very good article..one question , How good is the opportunities for SAP HANA. I’m into SAP CRM. i want to learn this new technology of SAP. I want to know how good is the demand for HANA in the Market. will there be any boost for my carrer growth ? HANA is the darling of Big Data and I see great future for it. You cannot go wrong there… I highly recommend that you learn it. Not only HANA will be a market winner, it’ll open doors to other Big Data tools for you. Wish you luck! Thank you very much for the reply and for your valuable suggestion, I started learning SAP HANA. Would love to hear your take on where/how Apache Solr is positioned. PHP is very valuable but not sufficient because there are many PHP programmers out there. I know that MongoDB is a good NoSql for PHP developers. You get to use both. Thanks for the informative article on Big data skill sets. I am a Linux system administrator. In which Big Data field should I hone my skill ? Linux, especially Red Hat is hot! my recommendation is to learn Hadoop Administration. Best wishes! You should keep an eye on the open source Berkeley Data Analytics Stack (BDAS) with Spark & Shark along with supporting start-up Databricks. BDAS is getting a lot of attention in Silicon Valley. Take the action you see as needed. Thank you so much for letting me know! I appreciate it. you need not to worry about the CodeProject – The Editors there are quick at preventing Plagiarism and I have directed an email to them. Very Informative Post ! Thank you very much Mr. Fari Payandeh ! que debo felicitar al autor.Saludos. Thanks for your wonderful article. I am thinking of moving to big data. I am currently working as a Microstrategy BI Consultant. Please advice. MRST is one of the best places to be for Big Data. It’s keeping up with Predictive Analytics. In my opinion you should stay with MRST, but learn the new tools. Thanks! Its gr8 that you spare your valuable time for helping others and am glad I found your article in web! Will continue to excel in microstrategy and learn other tools. Merry Christmas to you as well and best of wishes for 2014. BTW, sorry about the late reply. I was not available. I am a Mainframe developer with 6.5 yrs of experience. 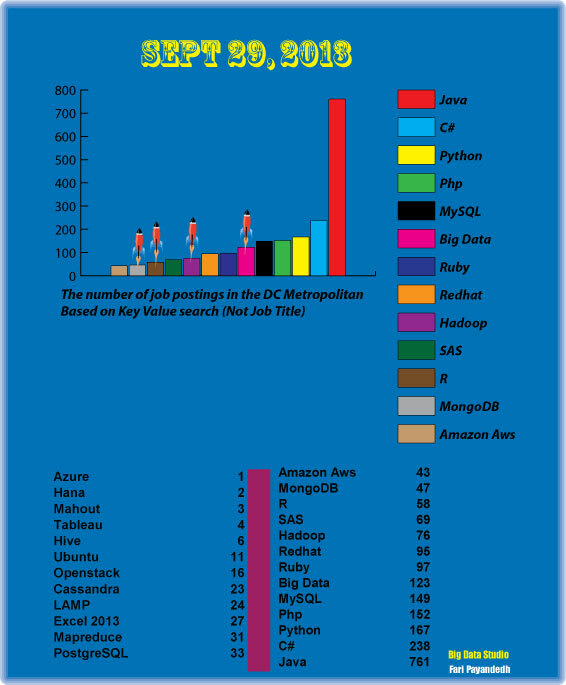 I want to pursue my career in Big Data using Hadoop. Will it be fruitful for me if I undergo a course and then go for a job search? Pl. Advise. I am bit confused. Considering your background as a developer, you might want to learn Java first and become certified. The next step would be to learn Hadoop. Once you accomplish that, you can start your job search… sorry but the transition is not easy, but you can do it. Thank you for your wonderful article. I am oracle forms developer with 4 yrs of experience. I want to move to Big Data but I’m not sure what it is best or the shortest way. Please advice. I am sorry about the delay. I wasn’t available. I’d suggest learning BI tools. Since you know how to build GUI application that would be the right place. Business Objects, Oracle OBIEE, Cognos, Microstrategy. Jaspersoft and Pentaho have open source BI tools. Also, learn R language. getting into Infographics is another option you have. Best wishes! I m having enty level experiance . i m proficient intrested in data science and and i am profient in pl/sql .kindly suggest which certification to get ? to good career in the feild of data science.. I would go learn R as well. But, to make a career choice in Big Data I would learn MongoDB… they have free online classes. i will like to change my carreer from being hardware engineer to data scienctist, please kindly advice on the step to take to become expert on the field.Thanks in advance. I have 7 yrs exp. last 2 yrs in project management and business analyst.Want to become data scientist. please advice on the steps. is there scope for research in this field ? would MS and PHD in this area help. Data Science jobs are more related to hype than reality. I’d recommend staying a business analyst or data analyst. I’d learn Tableau. The public version is free. Also R programming language. This would a great starting point. I am a PL/SQL database developer having 8 years experience developing operational data stores & batch applications. I have never had any opportunity to work on Informatica or any other ETL tool, nor any reporting tool. I now find that there are hardly in openings for PL/SQL developers in the market, particularly for people like me exceeding 8+ years. What is your advise for me to be able to break into DWBI market ? I have been a developer in Microsoft BI technologies (SSIS and SSRS) for the past 8-10 years. We have lot of jobs but the billing rates are not that high. I want to get in to Big Data as an architect or a manager (Not again as a developer). What do you suggest would be the best skills I should acquire. I give my self up to six months to change my domain/skills. You have just the right background for getting into Microsoft-Bigdata… I’d suggest learning Windows Azure, power view, powerpivot, and Excel 2013. You can learn it to the degree required to manage a Microsoft/Big Data project. Best wishes! Thanks for your article. I would be grateful if you could guide me with my career path. I am a sap bw consultant with 3 years of exp. Right now I am learning and working on sap hana and bpc. Is it wise to do a master’s on big data? Will sap hana help me get into big data or should I have to learn other tools and databases like hadoop and R.
I would get a master in computer science instead and keep learning analytical tools like Hana. R is a big plus. Thanks for your article. I have 8 years of experience in microsoft web development and very good hands on sql server. I want to move to big data technologies. Please guide me. I have 2.6 years of Experience as VBA Developer and now I want to move in BI. Kindly guide me which technology is better for me to good career and also i want to work in USA. So which technology is better for me to get me in USA. Sorry about the late reply. Since you are a developer, learning NoSql like MongoDB and HBase are the best to learn. Python and R programming languages are also good to know. Also suggest me that for Business Intelligence which technology is better for me or demand in USA market. Is this some kind of software or Technology? I was searched about tableau but really don’t understand. Request you to please guide me about tableau. Also please guide me about SAP BI and Informatica. I mean which one is better to learn or will make my career. Sorry about the late reply. Informatica Express is free to download. It has an excellent future in Big Data. SAP HANA is what you want to learn. Could you please let me know in SAP BI and Informatica, which one having excellent future and also take me out of from India. Acutually I am intrested in both of the technology but having little bit confussion about like what to do. Very well catogorized – Storage, Analyze, Visualize. Thanks for sharing the Article. This is very great article I ever seen for big data and hadoop. I am having almost 13+ years of experience in IT also having in depth functional knowledge in retail banking as well as telecom postpaid billing system. Technologically I am good in SQL PLSQL and unix. Presently I am senior developer in PLSQL and unix. i am 9 years exp in IT, including 3 years informatica,3 years SAP BODS ETL tool and also good knowldge in SAP BO. so wants a good technology like BIG DATA or HANA. Can you please suggest me wich one is best to get job in respective my ETL experience with market situation. Big Data is the best career choice for the next decade, There are no signs of depreciation in the number of job opening in big data technologies. Find best paid Big Data Jobs at CrediBLL.